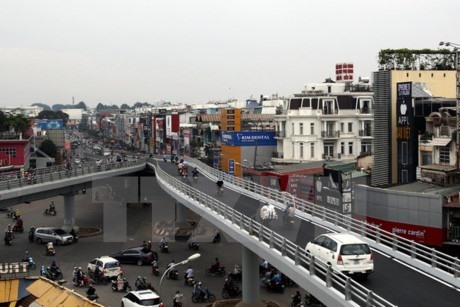 HCM CITY — The second bridge of the Y-shaped flyover in HCM City’s Gò Vấp District connecting Phạm Ngũ Lão and Nguyễn Oanh streets opened to traffic yesterday. It cost more than VNĐ 57 billion (US$2.51 million) and almost five months to build, two months fewer than scheduled. The two-lane bridge is 280 metres long and six metres wide, and allows vehicles to travel one-way to Nguyễn Oanh. The steel flyover, which cost a total of VNĐ406 billion ($17.88 million), has another bridge connecting Nguyễn Oanh and Nguyễn Kiệm Streets that opened to traffic last January.